The theorem provides a method for computing sets of dimensionless parameters from the given variables, or nondimensionalization, even if the form of the equation is still unknown. Although named for Edgar Buckingham, the π theorem was first proved by French mathematician Joseph Bertrand in 1878. Bertrand considered only special cases of problems from electrodynamics and heat conduction, but his article contains, in distinct terms, all the basic ideas of the modern proof of the theorem and clearly indicates the theorem's utility for modelling physical phenomena. The technique of using the theorem (“the method of dimensions”) became widely known due to the works of Rayleigh. The first application of the π theorem in the general case to the dependence of pressure drop in a pipe upon governing parameters probably dates back to 1892, a heuristic proof with the use of series expansions, to 1894. Formal generalization of the π theorem for the case of arbitrarily many quantities was given first by A. Vaschy in 1892, then in 1911—apparently independently—by both A. Federman and D. Riabouchinsky, and again in 1914 by Buckingham. It was Buckingham's article that introduced the use of the symbol "πi" for the dimensionless variables (or parameters), and this is the source of the theorem's name. More formally, the number of dimensionless terms that can be formed, p, is equal to the nullity of the dimensional matrix, and k is the rank. For experimental purposes, different systems that share the same description in terms of these dimensionless numbers are equivalent. where the exponents ai are rational numbers (they can always be taken to be integers by redefining πi as being raised to a power that clears all denominators). The Buckingham π theorem provides a method for computing sets of dimensionless parameters from given variables, even if the form of the equation remains unknown. However, the choice of dimensionless parameters is not unique; Buckingham's theorem only provides a way of generating sets of dimensionless parameters and does not indicate the most "physically meaningful". Two systems for which these parameters coincide are called similar (as with similar triangles, they differ only in scale); they are equivalent for the purposes of the equation, and the experimentalist who wants to determine the form of the equation can choose the most convenient one. Most importantly, Buckingham's theorem describes the relation between the number of variables and fundamental dimensions. with respect to the basis of fundamental units (distance, time). Making the physical units match across sets of physical equations can then be regarded as imposing linear constraints in the physical-units vector space. A dimensionless variable is a quantity with fundamental dimensions raised to the zeroth power (the zero vector of the vector space over the fundamental dimensions), which is equivalent to the kernel of this matrix. By the rank–nullity theorem, a system of n vectors (matrix columns) in k linearly independent dimensions (the rank of the matrix is the number of fundamental dimensions) leaves a nullity, p, satisfying (p = n − k), where the nullity is the number of extraneous dimensions which may be chosen to be dimensionless. The dimensionless variables can always be taken to be integer combinations of the dimensional variables (by clearing denominators). There is mathematically no natural choice of dimensionless variables; some choices of dimensionless variables are more physically meaningful, and these are what are ideally used. This example is elementary but serves to demonstrate the procedure. Suppose a car is driving at 100 km/h; how long does it take to go 200 km? This question considers three dimensioned variables: distance d, time t, and velocity v, and we are seeking some law of the form t = Duration(v, d) . These variables admit a basis of two dimensions: time dimension T and distance dimension D. Thus there is 3 − 2 = 1 dimensionless quantity. Since the kernel is only defined to within a multiplicative constant, the above dimensionless constant raised to any arbitrary power yields another (equivalent) dimensionless constant. has one physically relevant root, and it is unity. The fact that only a single value of C will do and that it is equal to 1 is not revealed by the technique of dimensional analysis. for some values of a1, ..., a4. which is dimensionless. Since the kernel is only defined to within a multiplicative constant, if the above dimensionless constant is raised to any arbitrary power, it will yield another equivalent dimensionless constant. Assuming the zeroes of f are discrete, we can say gT2/L = Cn, where Cn is the nth zero of the function f. If there is only one zero, then gT2/L = C. It requires more physical insight or an experiment to show that there is indeed only one zero and that the constant is in fact given by C = 4π2. 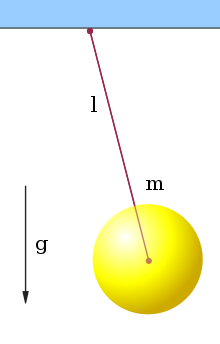 For large oscillations of a pendulum, the analysis is complicated by an additional dimensionless parameter, the maximum swing angle. The above analysis is a good approximation as the angle approaches zero. A simple example of dimensional analysis can be found for the case of the mechanics of a thin, solid and parallel-sided rotating disc. There are five variables involved which reduce to two non-dimensional groups. The relationship between these can be determined by numerical experiment using, for example, the finite element method. ^ Bertrand, J. (1878). "Sur l'homogénéité dans les formules de physique". Comptes Rendus. 86 (15): 916–920. ^ Rayleigh (1892). "On the question of the stability of the flow of liquids". Philosophical Magazine. 34 (206): 59–70. doi:10.1080/14786449208620167. ^ Second edition of ``The Theory of Sound’’( Strutt, John William (1896). The Theory of Sound. 2. Macmillan. ). ^ Quotes from Vaschy’s article with his statement of the pi–theorem can be found in: Macagno, E. O. (1971). "Historico-critical review of dimensional analysis". Journal of the Franklin Institute. 292 (6): 391–402. doi:10.1016/0016-0032(71)90160-8. ^ Riabouchinsky, D. (1911). "Мéthode des variables de dimension zéro et son application en aérodynamique". L'Aérophile: 407–408. ^ Ramsay, Angus. "Dimensional Analysis and Numerical Experiments for a Rotating Disc". Ramsay Maunder Associates. Retrieved 15 April 2017. Hanche-Olsen, Harald (2004). "Buckingham's pi-theorem" (PDF). NTNU. Retrieved April 9, 2007. Hart, George W. (March 1, 1995). Multidimensional Analysis: Algebras and Systems for Science and Engineering. Springer-Verlag. ISBN 978-0-387-94417-3. Kline, Stephen J. (1986). Similitude and Approximation Theory. Springer-Verlag, New York. ISBN 978-0-387-16518-9. Wan, Frederic Y.M. (1989). Mathematical Models and their Analysis. Harper & Row Publishers, New York. ISBN 978-0-06-046902-3. Vignaux, G.A. (1991). "Dimensional analysis in data modelling" (PDF). Victoria University of Wellington. Retrieved December 15, 2005. Gibbings, J.C. (2011). Dimensional Analysis. Springer. ISBN 978-1-84996-316-9. Vaschy, A. (1892). "Sur les lois de similitude en physique". Annales Télégraphiques. 19: 25–28. Buckingham, E. (1914). "On physically similar systems; illustrations of the use of dimensional equations". Physical Review. 4 (4): 345–376. Bibcode:1914PhRv....4..345B. doi:10.1103/PhysRev.4.345. Buckingham, E. (1915). "The principle of similitude". Nature. 96 (2406): 396–397. Bibcode:1915Natur..96..396B. doi:10.1038/096396d0. Buckingham, E. (1915). "Model experiments and the forms of empirical equations". Transactions of the American Society of Mechanical Engineers. 37: 263–296. Taylor, Sir G. (1950). "The Formation of a Blast Wave by a Very Intense Explosion. I. Theoretical Discussion". Proceedings of the Royal Society A. 201 (1065): 159–174. Bibcode:1950RSPSA.201..159T. doi:10.1098/rspa.1950.0049. Taylor, Sir G. (1950). "The Formation of a Blast Wave by a Very Intense Explosion. II. The Atomic Explosion of 1945". Proceedings of the Royal Society A. 201 (1065): 175–186. Bibcode:1950RSPSA.201..175T. doi:10.1098/rspa.1950.0050.